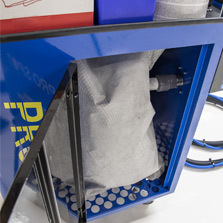 The Dust-Free Sanding Systems are patented, unique systems that safely and quickly extracts dust from sanding and collects it directly into a disposable bag. Both systems do not contain any electrical motors or parts which prevents explosion risks from heat and potential sparks. The patented air improvement module increases vacuum performance and operates on an extremely low air flow at 5-7 CFM compared to competitor systems that use 40-50 CFM. 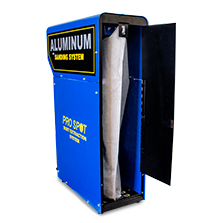 The low airflow keeps noise levels low while allowing you to save on air compressor needs and energy costs. 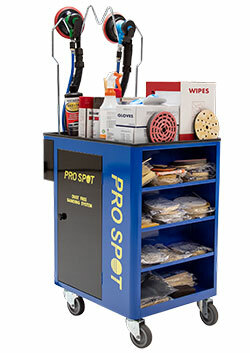 Keep your shop clean with the new Pro Spot Dust-Free Sanding System. This patented, unique system safely and quickly extracts dust from sanding and collects it directly into a disposable bag. The system does NOT contain any electrical motors or parts which helps to prevent explosive risks from heat and sparks. The patented air improvement module increases vacuum performance and operates on an extremely low airflow at 5-7 CFM (compared to competitor systems that use 40-50 CFM). The low airflow keeps noise levels low while allowing you to save on air compressor energy cost. 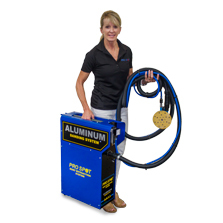 The Dust-Free Sanding System is extremely lightweight and portable weighing in at 14 lbs. 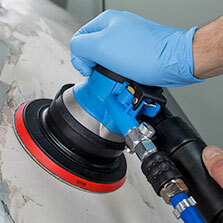 The patented, Orbital Vacuum Air Sander uses exhaust air for dust extraction at no additional energy cost. Provide maximum effective dust extraction with very low air pressure and convenient exhaust hose length. The Sanding Block makes hand sanding easier and more efficient. It gives the operator total control of the situation by giving the best results while eliminating dust as soon as it’s created. The back of the unit opens up making access to the bag easy and clean up even easier. The Combi is the perfect Dust Free sanding system for any shop. 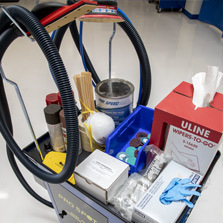 All of the features in our portable Dust Free system are included in our Combi Dust Free workstation and more! 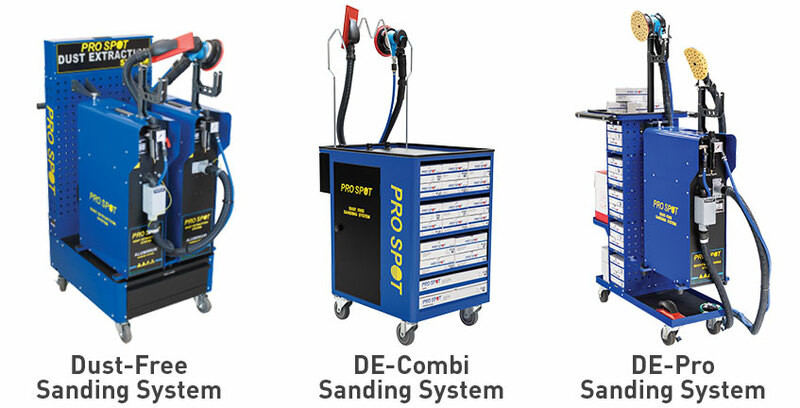 Everything you need in a dedicated sanding system is included with the Combi station, storage, 1 DA sander, 1 Sanding Block, a complete selection of our sanding discs, disposable dust bags all in a compact mobile storage unit. 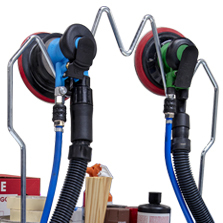 The Combi system keeps shop air clean and dust free using low volume compressed air only! No electricity Needed! 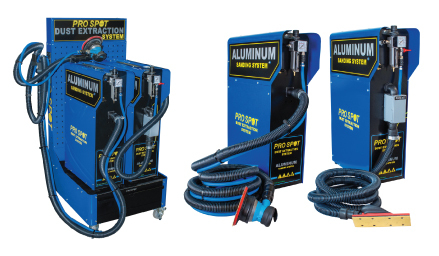 Use the Combi on either aluminum or steel automotive repairs. Have an existing vacuum DA sander? No problem! The Combi has a special inlet connection that easily accommodates an additional DA. Our Pro Spot multi hole sanding discs are ideal for any sanding job in the shop and can be used on any DA sander you may currently have. Part# DE-COMBI - The DE-COMBI is shown with two Orbital Sanders, but does not come with them. This set up demonstrates that the unit is capable of running two DA Sanders at once. Quickly access the vacuum bags when they need to be changed. 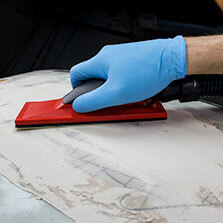 The Dust-Free Workstation comes with dedicated storage for sanding pads and sanders. 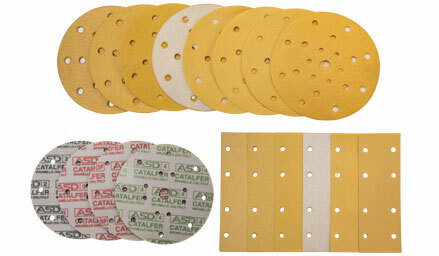 Pro Spot offers a wide range of sanding discs and pads that will meet any shops needs.